#1 When your co workers or random people ask if they can touch it. Sigh…I’m sure we have all been there. Whether short, long, big or small, people are intrigued by natural hair. They want to put their hands all over it and run their fingers through it. Or they do the “polite pet” on top of your head as if you were the featured animal at the national zoo. It happens to me all the time; on the metro, at work, in restaurants and while I’m out shopping. I mean, I guess I can understand, but if you don’t like it, do you just say no? What if it’s your co worker you see every day? Will that make things awkward? Though more and more naturals are popping up, natural hair is still attention grabbing and if you have or are used to seeing straight hair, it can make you wonder. I used to get really annoyed but now, not as much. People are curious and I can understand that BUT instead of asking to “pet” us, I would prefer it if everyone just kept their curiosity, and hands, to themselves. Have you ever been asked? What was your response? #2 When you try mixing new products for your wash and go and they leave little white balls or residue on your hair and you have no time to wash it out. OMG!! This happened to me twice and both times I was in a rush to go somewhere. Ladies, never EVER experiment with mixing new hair products right before you have some place to be. Trust me on this. The first time this happened to me I was getting ready for a date with a guy who I was really interested in and excited to see. It was our second date and we were going to catch a movie and grab a few drinks afterwards. I decided to wash my hair right before the date and just wear a wash and go. For some reason, I decided to mix two products that I’ve never mixed before and immediately little white balls started to form and cover my hair. I thought they would eventually disappear so I continued to apply to the rest of my head. Talk about a mess! It looked as if I hadn’t washed my hair in months. Then I get an “On my way!” text from him. Panic set in. I plugged in my diffuser thinking maybe once it’s fully dry the white balls would go away, wrong! Still there. Another text comes through, “Downstairs”. Damn’t. Nothing more I could do. My white balls and I were headed out the door to go on a date. To this day I’m not sure if he noticed and just didn’t say anything. Maybe it’s the very reason we aren’t together today. Lol!! The second time it happened I was in a rush to get to work. I was smart this time though y’all. I called in sick. Hey, you use yours for actual sick days and I use mine for bad hair days. #3 When you’re sitting in the front row and you’re politely asked to move or lower your hair. Yep, you guessed it. I got asked to “lower” my hair by an older gentleman behind me in the movie theater. I get it. You pay your almost $20 to see a film so you don’t want some big ‘ol ‘fro obstructing your view. So instead of getting upset, I just slid down in my seat. Since that day, I don’t even bother sitting anywhere but the back row if I’m rocking a fro or a puff. #4 When you find little curls and coils all over the floor in your house. In the shower, on the bathroom floor, kitchen, living room, bedroom. It’s a wonder how I still have any hair left on my head! I’m not sure if this is what comes along with the natural hair territory or if I’m constantly shedding winter fur like a bear, except all year long. Thank God for brooms and vacuum cleaners or else I would never have company over. #6 When your boyfriend or friends ask you to go out an hour before time and your hair isn’t done. You’ve been sitting comfortably on the couch or in bed all day watching Love and Hip Hop and eating pizza, and all of a sudden your phone starts blowing up. Yes, you want to go out but your old twist out or wash and go is sitting on top of your head like a bird’s nest. You can’t just get up and go. Do you text them back “nah” or do you try and tackle the beast in efforts to get out and have some fun? I personally need at least a 3 day notice before I go anywhere. I know, I know. Seems a bit extreme, right? Well, maybe it is but it takes about that long for my hair to look perfect. Third day hair is the best hair for me and don’t we all want to look and feel our best when we go out with friends or our main squeeze? As much as I would like to consider myself spontaneous, that’s just not the case. If this hair is not right, it’s highly likely will be responding “nah” and tuning back in to Stevie J and Joseline. #7 When your hair isn’t short but it isn’t long, otherwise known as The Awkward Stage. I think most naturals will experience the awkward or in between stage at some point. During this stage, your hair probably hangs right over your ear, so it’s not quite full afro status, but it’s also not a twa. You can achieve a twist out but you can’t quite rock a puff. I know, I know. It’s like a rite of passage in a sense. My advice during this awkwardness is to just hang in there and be patient. Length and better days are coming! 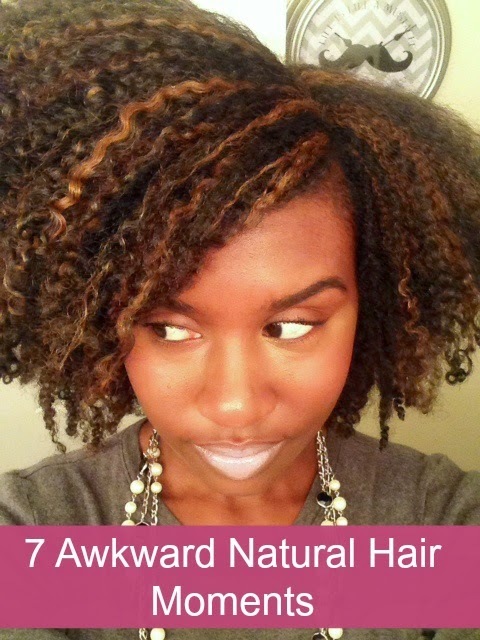 What's your awkward natural hair moment? !